My view is that you don't just talk to your friends. You talk to your enemies, as well. And the diplomacy involves talking to your enemies. You don't reward your enemies necessarily, by talking to them if you're tough and you know what you're doing. You don't appease them. Talking to an enemy is not, in my view, appeasement. James Addison Baker, III (born April 28, 1930) worked in President Ronald Reagan's administration, first as Chief of Staff from 1981 to 1985, then as Secretary of the Treasury from 1985 to 1988. After running George H.W. Bush's successful presidential campaign in 1988, Baker was appointed Secretary of State by President Bush in 1989. 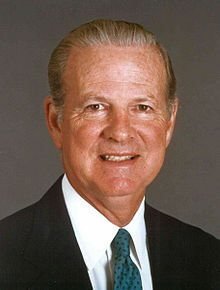 The James A. Baker III Institute for Public Policy at Rice University in Houston, Texas is named after him. In 2006, he was named the Republican co-chair of the newly-created Iraq Study Group (Lee Hamilton was named the Democratic co-chair). "You must tell them that there must be a new union or there will be chaos," he [Shevardnadze] implored me. That evening, when I hosted republic leaders for dinner — a mixed group of presidents, prime ministers, and foreign ministers — I saw around the table and in the conversation a microcosm of the post-coup Soviet Union’s potential — and its problems. Whatever euphoria that they felt with their post-putsch independence declarations had given way to a marked degree of realism. "Independence sounds nice, but we have to live, and we have to be practical," observed the Prime Minister of Moldova, Valeriu Muravsky. That was the persistent theme that I heard from every one of the republic leaders, with the sole exception of the Georgian Prime Minister, Vissarion Gugushvili, though even he spoke of the need for economic cooperation once Georgian independence was recognized internationally. My view is that you don't just talk to your friends. You talk to your enemies, as well. And the diplomacy involves talking to your enemies. You don't reward your enemies necessarily, by talking to them if you're tough and you know what you're doing. You don't appease them. Talking to an enemy is not, in my view, appeasement. I made 15 trips to Syria in 1990-1991 at a time when Syria was on the list of countries who are state sponsors of terrorism. And the 16th trip, guess what? Lo and behold, Syria changed 25 years of policy and agreed for the first time in history to come sit at the table with Israel, which is what Israel wanted at the time. And, thereby, implicitly recognized Israel's right to exist. Now, all I'm saying is that would never have happened if we hadn't been sufficiently dedicated that we were going to keep at it. On the October 5, 2006 edition of the Fox News Channel's Hannity & Colmes.